Is it Normal to Itch After a Hair Transplant? Think back to when you were a kid. I’m willing to make a bet that there were quite a few occasions when you fell over or fell off your bike. You probably cut your knees or scraped your elbows too. Remember how much they itched, and how much you just wanted to pull the scabs off? And remember how your parents or teachers told you to leave well alone, because you’ll end up with a scar? Well the same goes for having a hair transplant. 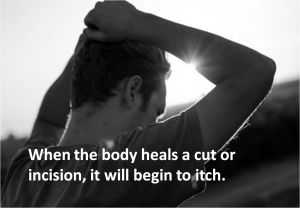 When the body heals a cut or incision, it will begin to itch. So as a hair transplant involves your surgeon using a sharp punch tool to remove small pieces of tissue (‘follicular units’ that contain hair follicles and hairs) from the back of your head and then transplanting them into small holes at the front and top of your head, it’s going to itch as it heals. The puncture holes at the donor site and the recipient site are tiny, especially compared to the gravel pitted cuts and grazes on your knees of yesteryear, but they’re still wounds, nonetheless. So to understand why your scalp will itch, let’s look at wound healing in more detail. Within a few minutes, the blood will start to clot. This means it thickens, due to a rush of platelets to the area. This stops the bleeding and the clots collect to form a dry, protective scab over the wound. This stops bacteria and dirt getting into the wound and causing an infection whilst it’s vulnerable and healing. At this time, the immune system is also kicking in, to also protect the area against infection. You might notice this in the form of swelling and tenderness in the days after your hair transplant and is completely normal. Blood vessels are also in action, widening to allow more oxygen to the scalp, which aids healing. You might feel tingling and again is totally normal. The platelets and white blood cells can then get on with their job of repairing the broken skin and the fibroblasts create collagen in the area, which acts as a framework for the new skin tissue to sit on. The wound then fills in with new tissue, called granulation tissue, which is then eventually covered with new skin within a few weeks. It’s during this time that you might notice that your start to itch. As the scabs start to fall off, the new skin below might look a little pink and shiny, which is totally normal. 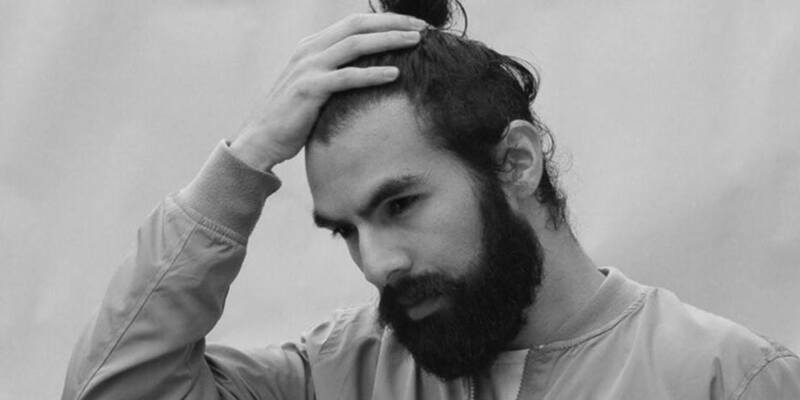 With larger or deeper wounds, scarring may occur, but this is unlikely after an advanced Follicular Unit Extraction, or FUE, method of hair transplantation, such as the type used in our clinic. And all this happen without us even asking our body to do it, it just does it! Amazing, huh? The good news is, the smaller the wound, the quicker it will heal. But as you’ll potentially have thousands of tiny puncture wounds, this will still take time. Your scalp has gone through a fair bit of trauma, so expect it to take it’s time to settle down. Now that we understand the biology behind wound healing, we can better understand why this causes itching. As the red and white blood cells go about doing their thing and the wound heals, the edges of the wound draw inwards, making the wound smaller. This is easier to imagine on a larger wound. Think about those cuts on your knees. Even without picking, the scabs tended to shrink inwards didn’t they? Only getting stuck on the middle bit, that last remaining, frustrating bit, that if you picked it off too soon, would cause the wound to bleed again. This wasn’t because the middle bit was the worst part of the wound. It was because wounds heal from the outside in, and the centre is therefore the last bit to heal. The same happens, on a much smaller scale, with the tiny puncture wounds in both the donor and the recipient site after a hair transplant. As any wound gets smaller during the healing process, the skin cells pull together to pull the wound shut. And it’s this process that activates the nerves, which send signals to the spinal cord to cause an itch. Plus, during healing, these same nerve fibres are stimulated by a chemical called histamine. This is the same chemical that’s released during an allergy such as hay fever, which causes itching. Histamine comes charging to the area of a wound to defend the body against outside intruders. And it’s all part of the normal healing process. So we know that the scars that form are there to protect us while the skin heals. And we know why this process causes itching. So, its now easy to see why we shouldn’t scratch these scabs off! Removing the scabs too soon, no matter how small, will disrupt the intricate healing process going on underneath, and potentially damage the delicate new skin tissue forming. This can lead to infections (no matter how clean your hands, you can still transfer dirt and bugs) and scarring. But even more so, scratching at your scabs in your recipient area, that is, the area with the newly implanted hair follicles, could cause your hair transplant to fail. In the first month you might feel like your scalp does nothing but itch. But it really is important to resist the urge to scratch. The new follicular units need time to bed into their new home in the front and top of your scalp. The last thing you want is to remove them by scratching or touching your scalp. If you do, you also run the risk of folliculitis, a condition where the follicles become inflamed and infected, and in turn, even more itchy. This can then spread all over the scalp, rendering your hair transplant useless. Then, your surgeon will give you a few different medications and scalp products to use. It’s important that you use these exactly as prescribed. You’ll be given a special medicated shampoo and possibly a special lotion and / or a moisturising spray. If the skin on your scalp becomes dehydrated it can make the itching feel more severe, so using these lotions and sprays can help soothe the area. It’s also a good idea to keep hydrated by drinking plenty of water and staying away from alcohol for a few weeks. Avoiding smoking also helps, as this can cause the tiny blood vessels in the scalp to stop delivering oxygen to the area, exacerbating the problem. If your itching becomes unbearable, speak to your surgeon. They may be able to prescribe a different lotion or shampoo. They may also suggest other measures such as applying petroleum jelly (Vaseline) or a skin oil or taking antihistamine tablets to control the itch. However, this must only ever be done under the supervision of an experienced hair restoration surgeon. Never apply anything to your scalp or take a medication from elsewhere without consulting with your surgeon first. So congratulations, you’ve made it this far, your new hair is in sight! Have you planned your new hairstyle yet…? It’s crucial that you follow the advice that your surgeon gives you when you leave the clinic. You would’ve been talked through what to expect at your consultation and pre-operative meetings too. Plus you’ll be given lots of leaflets and your dedicated patient coordinator will also be on hand to answer any questions you have. Do everything you’re told to do, and resist that urge to scratch that itch, and you’ll soon be enjoying your stunning new hair. If you’re looking to start your hair restoration journey, get in touch with us for your free online consultation today! « So, You’ve Decided to Have a Hair Transplant in Antalya, but what Can You Do Whilst You’re Recovering? !